Along with the Samsung Galaxy S10 phone, Samsung has also launched a pair of true wireless headphones - the Samsung Galaxy Buds. The Samsung Galaxy earbuds are available for purchase now, so we've put together a list of the best prices and sales from several retailers below. The Galaxy Buds are lightweight and compact and come with three adjustable ear tip and wingtip sizes so you can find a size that's right for you. The water-resistant earbuds also feature touch controls so you can turn up the volume, skip songs and more with a touch to your ear. You can also control the Galaxy Buds from its compatible app which offers a "Find My Earbuds" feature if you ever misplace them. The Samsung Galaxy Buds currently retail for $129 (£139 / AU$249) which is actually cheaper than Samsung's previous truly wireless headphones, the Gear IconX ($149.99 / £157). The only features that the Galaxy Buds lack when compared to the Gear IconX are the ability to load your music to the earbuds, increased water-resistance and audio coaching for exercises. 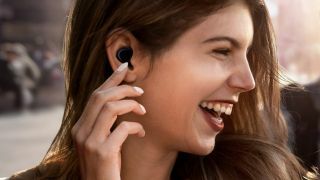 The Samsung earbuds are also cheaper than Apple's Airpods ($159/£159) which makes the Galaxy Buds one of the most affordable high-end wireless earbuds on the market. You'll find all of the prices below from several different retailers so you can find the best deal that's currently available. If you're interested in Samsung's newest phone you can find the best Samsung Galaxy S10 prices and deals and you can also shop the best Samsung Galaxy Watch Active prices and deals.